If you own a home in an area where cold temperatures are common, you may be familiar with an unruly problem known as ice dams. You may also have experienced roof damage that was likely caused by an ice dam, but without fully knowing the tell-tell signs, you might have been none the wiser. To help you understand the severity of ice dams, we’ve crafted a tell-all informative guide about the what, where, how, and why of winter’s sneakiest devil. Ice dams occur when snow melts near the ridge lines of warm roofs – roofs without adequate ventilation. As the water runs down the roof to the overhang, it cools and freezes and can lodge at the edge of the roof. If the snow continues this melt and freeze process, an ice dam forms, stopping the melting snow or water from draining off the roof and can potentially seep underneath the shingles, sink through the decking and make its way into the house. 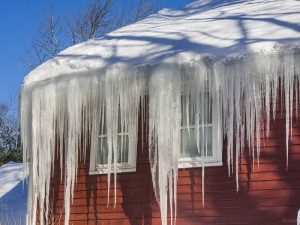 If not apprehended, ice dams can cause significant roof damage, roof leaks, including damage to your walls, insulation, and ceilings. Where is an ice dam likely to form? 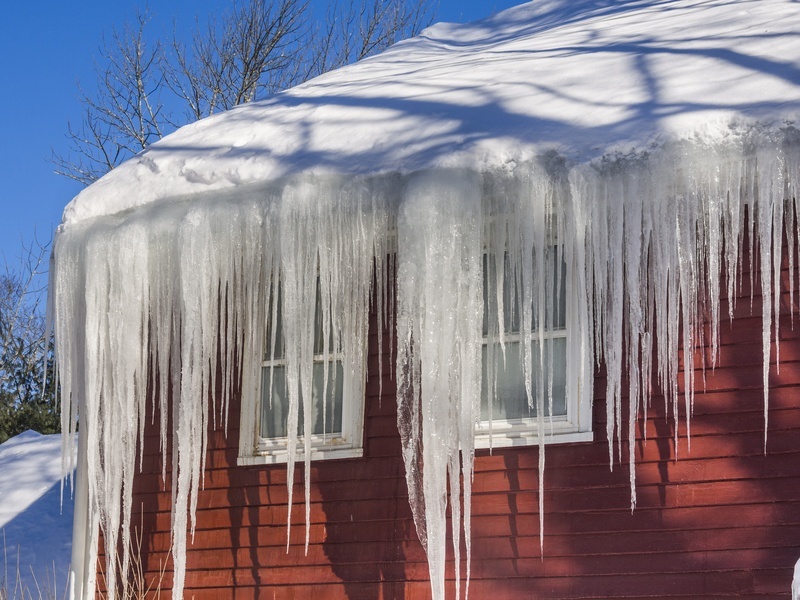 Ice dams are common on warm roofs, or poorly ventilated roofs. Ice dams typically for near the edges of the roof, insinuating that it is the other sections of the roof that’s experiencing high levels of heat and melting significant amounts of snow. The heat coming from the home travels through the roof surface in three modes: conduction, convection, and radiation. Clean off your roof. One of the quickest ways to fix an ice dam clog is to remove as much of the snow off the roof as possible using either a roof rake or broom. This will remove one of the main components of an ice dam formation and temporarily free your roof of any further damage. Draining the water from behind the roof is also a good solution for getting rid of ice dams. You can do this by making channels in the ice dam to allow the water to seep through. One of effective method for doing this is hosing the ice dam with high water on a warm day. Another solution is reinforcing the structure of your ceiling so that it is airtight, impeding cold air from rising to the attic and roof. This means that your roof will now collect more snow due to the lack of heat loss that’s going to take place. Make sure that your roof is up to code and can manage the additional load before initiating this process. The simplest, and quite possibly the most convenient way to prevent ice dam build-up is to install an well-ventilated roof. One that will remain cool all year round and decrease heat loss.